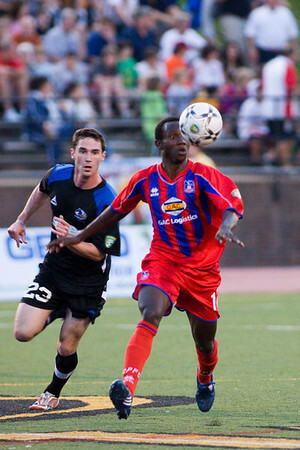 Result: Crystal Palace FC USA 3, Pittsburgh Riverhounds 0. Played at UMBC Stadium, Baltimore in front of a crowd of 3,104. Goalscorers for Palace, Gary Brooks, Alex Ughiovhe and Pat Healey. New goalkeeper Matt Nelson saved a penalty, while Alex Ughiovhe and Cecil Lewis both received red cards, as did Jason Kutney for Pittsburgh. Matthew Mbuta beats Jeff Hughes to the ball.